... but it includes also a temperature sensor. 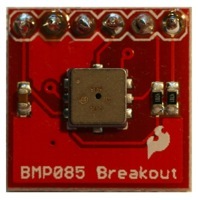 As you can see on the following diagram, the temperature sensor of the BMP085 has less noise compared to the TMP36. On the second graph you can also see, that the BMP085 has a much better resolution than the TMP36. Please notice also that there is a slight but constant difference between the mesured temperature of both sensors.